I wrote a negative review of BT and the CEO jumped ship. Coincidence or not? BT’s share price has fallen by more than 50% over the last two years and today it’s dividend yield is around 8%. Ever the bargain hunter, I decided to take a closer look. I wanted to see if at BT had any major problems, or if the market was overreacting as it so often does. What I found was the usual suspects: A serious lack of long-term growth, mediocre profitability and a balance sheet as strong as a sheet of glass, largely thanks to BT’s colossal pension scheme. This put BT firmly into the ‘bargepole’ category. 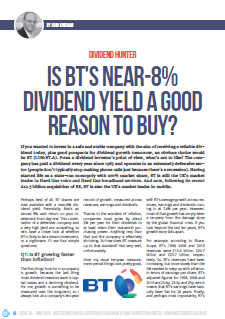 However, I think it’s important for newer investors to learn about (and hopefully avoid) these recurring problems, so I wrote up the BT review as an article for the June issue of Master Investor. That issue went live a couple of days ago and today BT’s CEO announced that he’ll be stepping down because there is “a need for a change of leadership”. Is BT’s near-8% dividend yield a good reason to buy? * I’m joking, of course. If you want to build a high yield, low risk portfolio of shares then take a look at these free worksheets and spreadsheets. If you would like full access to my stock screen, model portfolio and latest buy/sell decisions, sign up here. 1. based on your criteria, there is virtually no telecom that fits, right? (they all have high levels of debt) Or do you consider pension deficit to be a “worse” kind of debt that others? 2. is the 11.3 pension deficit included in the balance sheet? (maybe under “Retirement benefit obligations” and “Loans and other borrowings”?) I am a little bit confused, because I don’t see it there “directly”. I have only found it elsewhere in the report. 1) Two that have lower levels of debt are Telecom Plus (which I own) and KCOM. But yes, most of them have lots of debt, probably because of the large amount of capital investment required. That update also includes the deficit reduction plan. I hope this change will be reflected in next reports because “little retail investor” like me relies on standard reports – balance sheet, cash flow, income statement. Hi Robert, sadly this is the sort of volatile liability you can expect when a company has a near-£60 billion pension obligation as BT does (and BT’s market value is a mere £20 billion). When pension liabilities and assets are on that scale, small percentage swings in the value of either assets or liabilities can create huge changes in the net liability, i.e. the surplus or deficit. Perhaps the best solution would be for BT to scrap its dividend and funnel all spare cash into the pension fund until the problem was more or less resolved. But it would be a hard pill for many shareholders to swallow. John you’ve raised some excellent points in this article. One of the reasons why I shy away from turn around stocks is because I know as a private investor with a minute holding I will have little influence over the management of a company. Unfortunately, in such situation, the fate of the company is literally in the hands of the management. This gives me some form of reassurance that my capital is not entirely dependant on the steward of the company rather it is the economic moat that will buffer it and hopefully allow it to grow. BT is an example of a company that has been unable to shift its culture from being a public enterprise to a private one. BT also knows that it is of strategic importance to the UK and even if the company is mismanaged the government will most likely bail it out like Rolls Royce. In 1971 the government allowed Rolls Royce to go into receivership and it subsequently nationalised it to allow it to continue. The bad news is that the investors will lose all their capital whilst the management and employees keep their jobs. Yes, it seems like the ex-monopoly public companies like BT and Centrica (which I own) start off with a dominant market position, but the public and government go bananas if they make too much profit so they can’t really lever it to their full advantage. John, All admirable comments in analysing the individual details on debt, growth, stability and pension liabilities. I was lucky enough to have sold BT on 12 Feb 2015 for 449.3 after having bought and held it for 5 years from 153p up to 215p in 4 tranches. It was a big position for me, however, at that time of the sale, the issues were indeed growing and the company subsequently made the leap with football rights etc, and the poor customer service decisions etc. Today, I’ve started buying it again at the 20X level — Why? Well despite all your reasoned arguments, I firmly believe that the new Chairman will sort the direction out and the valuation as it stands is low enough to balance the risk. Simply put, if you strip out OpenReach in it’s own right, and there are already interested parties, the valuation of that element alone goes some way to hitting the current market cap of BT. The pension deficit could easily revert, given rising 10 year bond yields – and I do accept that your main concern with pension is not the deficit itself, but the size of the fund and the subsequent relative impact that can have on a single years company profits. In this case it could, should, end up being disproportionately positive wrt to BT and the numbers could, should, look very different. In essence, much of the measurement of debt in the pension funds is based on the arbitrary actuarial valuations based on nebulous predictions. On another topic, mine and your holding in Victrex is performing rather handsomely, no? Hi LR, you’re right in that BT’s pension deficit could dramatically reduce if long-term interest rates rise. However, for me this represents too much uncertainty and risk in the hands of something which is completely outside the company’s control. A far better solution (IMO) would be for BT to hand over a very large chunk (or even all) of the pension scheme to an insurance company (such as L&G which I own and is in the UKVI portfolio, entirely coincidentally of course) and insure the funding uncertainty for a fixed fee. However, management probably haven’t done this because it would be massively expensive (in absolute terms, not risk-adjusted) so they seem to be crossing their fingers and hoping for higher interest rates to fix things, rather than dealing with the fundamental problem (i.e. the pension scheme is too big! ).